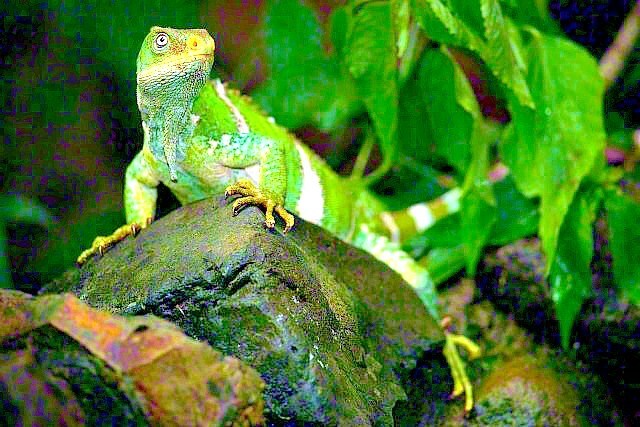 The Fiji banded iguana is a spectacularly beautiful, large, emerald-green lizard named for the highly distinctive, broad, vertical blue to light green stripes on the body and tail of males. Females, by contrast, are usually uniformly green, occasionally showing a few white to pale blue spots. Both sexes have red-orange eyes, bright yellow-rimmed nostrils and a short crest of raised scales running down their spine. The extremely long tail makes up more than two thirds of the lizard’s total length, and is used for balance as it climbs amongst the forest branches.